It has been really hard over the last few weeks here at the sanctuary with freezing conditions and now snow. All of the animals water has been frozen solid, we have had to carry buckets forwards and back morning, afternoon and evening to the larger animals as the water troughs automatic fillers are frozen. With so much more work involved in this weather we are desperate for someone to help with mucking out and care of the animals, please contact us if you or anyone you know can help. 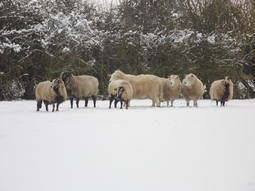 All of our animals are staying snuggled in their straw and only venture out into the snow for food, water and toilet. I think everyone here at the sanctuary is desperately looking forward to spring! Daisy and Lola the two one year old sisters have now found a loving home together.